It was a strange funeral in Philadelphia. Nobody knew the boy they were burying, only that he was found dead more than 40 years ago. Somebody loved this kid," says detective Tom Augustine. "He did have a mother, had a father. Maybe he had brothers and sisters. I don't know." They were reburying him after digging him up from an anonymous grave in a potter's field. After all these years, almost everything about this boy's life and death is still a mystery - even who he was. On February 25, 1957, a foggy day, Sam Weinstein, now a retired detective, was one of the first policemen on the scene. Weinstein was responding to a call about a suspicious box. He found a boy's beaten body, stuffed inside the box. "The boy was stripped of his identity," says Weinstein. "He had no clothing. His hair was chopped off - bruises from head to foot." Forensics determined the boy was about 4 years old, and had died from head injuries. When the medical examiner arrived, Weinstein lifted him out of the box. "I saw so much hurt and so much fear in his face," Weinstein says. "As hard-hearted as I could be, it really got to me." It still gets to him, he admits. From the beginning, police had hundreds of leads about the child they called the Boy in the Box: a blanket cut in two pieces that he was wrapped in; the box itself, which was traced to a J.C. Penney store. The FBI released a retouched photo of the boy. Police compared the boy's footprints to thousands on file in hospitals throughout the area. But it all led nowhere. Had he lived, the boy in the box would be about 48 years old today. But in the years since his murder, potential police sources have either died or forgotten important information. With every passing day, this case was getting older, and colder. Until four years ago, when another Philadelphia detective, Tom Augustine, asked to be assigned to this case. "Somebody knows who this kid is," says Augustine. "I'm convinced of that. It's a deep, dark secret in somebody's closet." Detective Augustine became interested in this case when he was a child and saw pictures of the Boy in the Box on police posters all over town. He got a big break when a book about the case and a television show, America's Most Wanted, suddenly brought in more than 200 new leads. Incredible after more than 40 years, but with so many leads, the younger detective (Augustine) turned to the older detective (Sam Weinstein), who was now a member of the Vidocq Society - a group of retired investigators who work with police to solve old murder cases. They're still checking out every lead. A woman in New Jersey was convinced the boy is a missing child she knew back in the '50s. Another woman blames it on witchcraft. She believes the boy was given up as a sacrifice. Every lead is a dead end. But everyone who has worked this case since the '50s has been suspicious of a foster-care home that used to be in a building just about a mile from where the body was found. "We didn't get too much cooperation there when we did the original investigation," says Weinstein. The police heard the children there had the same haircuts as the boy in the box, and the same blankets as the one found covering his body. Someone came forward with old movies from inside the house. But the haircuts in the movies didn't match. It was another disappointment. 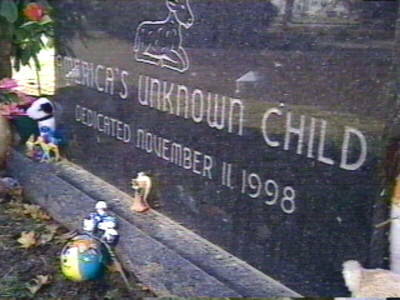 In 1998, police dug up the boy's body to obtain DNA samples. But they still need to find his family to make a match. Most of what the detectives do, says Augustine, is grunt work. Health problems have sidelined Sam Weinstein, but Joe McGillen and Bill Kelly, two retired investigators who originally worked the case, have stepped up to continue the grunt work. "We'd like to think, in our heart of hearts, that we're not necessarily all that far away," says McGillen. This case has haunted two generations of detectives so far, each one hoping the next lead will be the real thing. Augustine hopes the boy will be identified soon. "I would also get great pleasure out of locking up the person that beat this kid, that beat this kid to death," he says. When will the case be solved? "Maybe next week, maybe tomorrow," says Augustine. "But you can't give up. You have to hang in." Even though this case still baffles authorities after so many years, there is something heartening and simply human about all the detectives trying to solve it. Consider, it's a case where there are no known family members to spur on investigators or demand answers. When it comes to closing the Boy in the Box case, or other "cold cases", there are countless dedicated detectives, past and present, who are driven to seek justice.